I know I shouldn’t do it. Really, I do. My boyfriend has taken his thrust-upon-him participation in this Mrs Beeton adventure with good grace so far. He’s pleased that I’m so enthusiastic about trying new recipes. He really is. He’s even (mostly) willing to sample the results and provide honest comments of the please-don’t-slap-me-for being-too-honest variety. But there’s one thing that I know, without it being explicitly spelt out, that I shouldn’t ever do. And that’s to come between a man and his meat. Dress the meat, sure. Put fancy vegetable things on the side, well, OK. Fry it, batter it, boil it, you name it – all that’s well and good. But, whatever you do, don’t be adding ”fruity” girly things to a man’s meat. 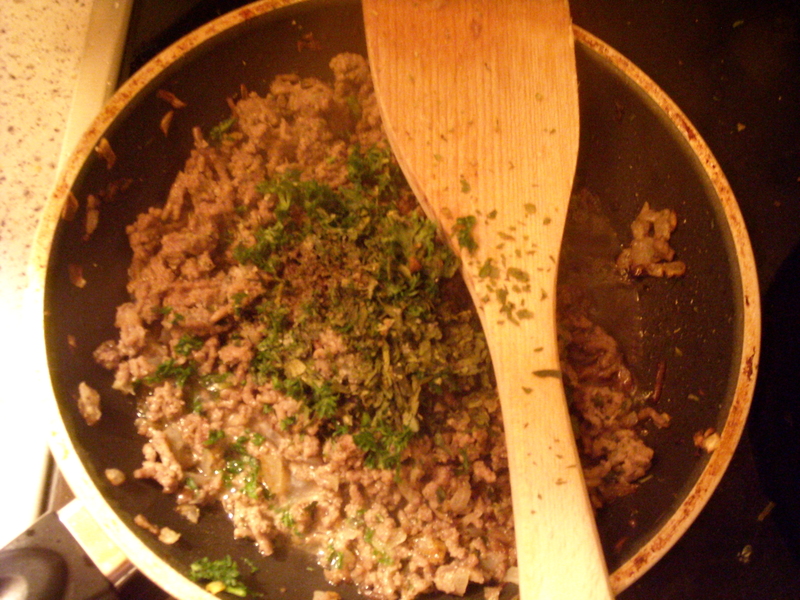 Above all, do not – and I repeat DO NOT – go mixing lemon and minced beef together. It’d surely be a recipe for disaster in more ways than one. All these thoughts were running through my head as I stared at the recipe for ‘Minced Collops’. But then I realised – there are plenty of things that he’s so far tried and actually enjoyed, despite all the insistence to the contrary before I serve it up. 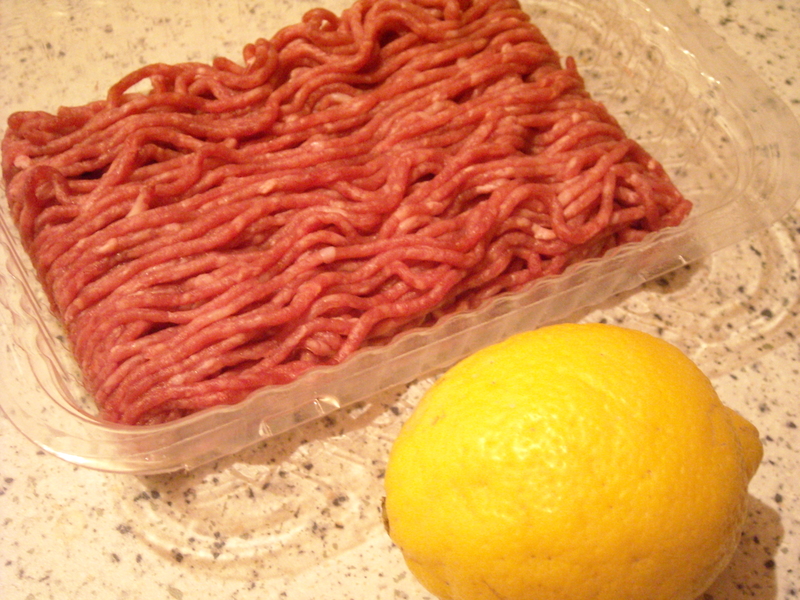 And I also figured – I don’t actually have to tell him that I’ve put lemon and mince together. He won’t actually know it’s lemon unless I tell him. Will he? The only savoury herb I had in the house was parsley, plus some dried bärlauch (Bear’s Ramson / Wild Garlic), so I chucked those in for good measure. Unfortunately, he hates parsley, so I had to chop it up finely to avoid it being detected. (Just for the record – I’m not into culinarily torturing the poor guy just for the laughs (well, not always). I did try to do a vegetarian version of this alongside my boyfriend’s meat version, but that didn’t fly – the vegetarian mince brand I used just didn’t cut it and I gleefully – I mean, reluctantly – pulled out a fabulous vegetarian schnitzel from the fridge and cooked it up for myself). 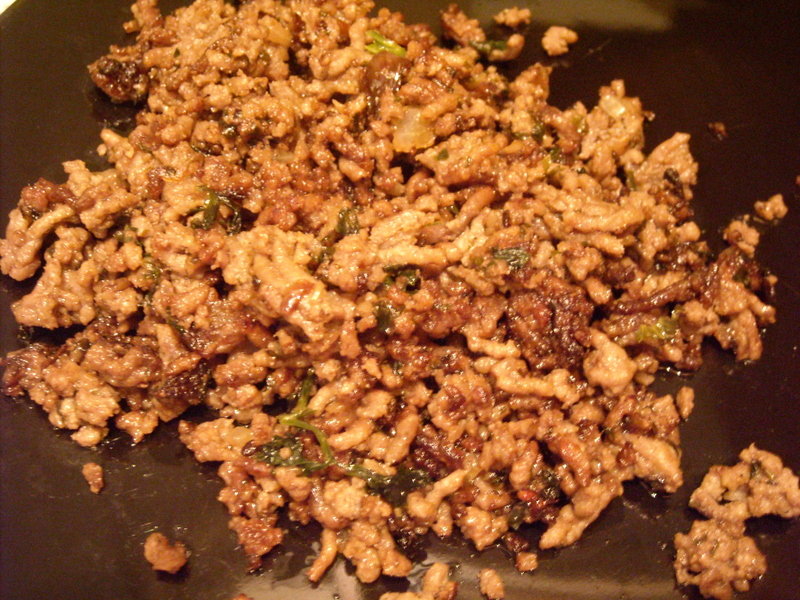 His meat did look kind of gross… like fried brown lamb brains. Ick. But you know what they say – a rose by any other name and all that. He merely gave me one of his funny sideways looks and ‘you weirdo’ smiles and took our plates out to the living room. “So?” I enquired as he tucked into the mess. “Really?” said I in surprise. He even claimed that he’d eat it again, albeit without much enthusiasm. Somehow, I just don’t see this one appearing on the menu again anytime soon. This entry was posted on February 16, 2010 at 8:55 pm and is filed under food. You can follow any responses to this entry through the RSS 2.0 feed. You can leave a response, or trackback from your own site.